Voice comment is an unique feature for Amaze VR that enables users to leave comment using voice, which enables user-to-user interaction. The recorded voice is also transcribed for discoverability. The feature has launched on Sep.2017 and well received from users as it adds additional value to watching experience. Acted as a lead UX and work with executives to define the scope of the project. Voice to text Translation : Initial plan was to create a voice recording feature without text, which caused discoverability issue. Anonymous: While it’s uncommon not to have identities for comment system, I decided to skip 1. Amaze VR have no log-in 2. To lower the barrier for recording voice. Listening to the comment is the core experience of the voice comment. That's why interaction of listening comment is the key for this feature. By tapping a comment button on the video menu, it plays the first comment automatically. If users don't want to listen, but read comments, they can click on Pause button. But the pause button will be enabled when users click on any comment cell. The unique part of the voice-enabled comment is that users can read other comments while listening to a comment. Scrolling comment list doesn't affect the play of a comment unless users click the other comment to listen the embedded voice. While it's important to create user-to-user interaction, the word design of the guided text for leaving comment is crucial as users need to know what to talk before recording. Unlike the text-based comment, the recording your own voice without a proper prompt. After analyzing the qualitative data, the review step was removed to increase the number of comment while leaving the option to delete the comment easily, which resulted positively. To onboard users in the main menu, "Best comment" menu was added to the bottom navigation. The objective of the best comment is to leave the positive impression on this new feature by curating interesting comments to listen in the first place. If users are intrigued by the best comments, users can also click on thumbnails to watch the video, which is a part of recommendation. 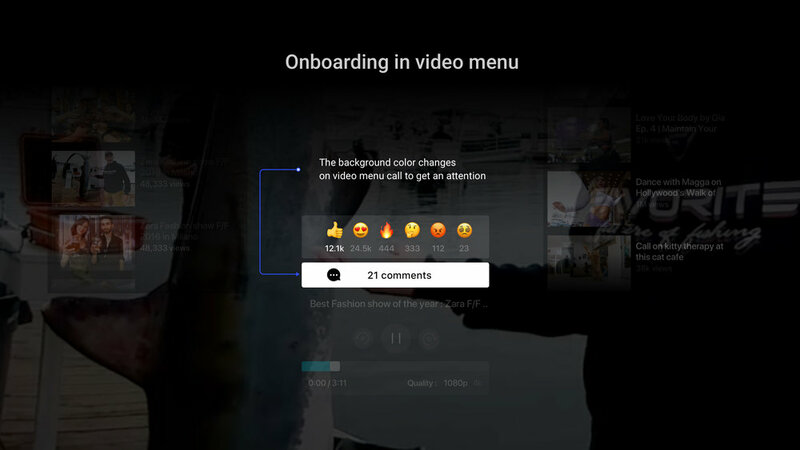 Since listening to comment is secondary experience for Amaze VR ( watching VR contents is the key experience), the onboarding of the comment is subtle. The comment button changes its background color to white to call an attention when the video menu is called until users click the comment button. 3% of users left voice comments. While this feature has implemented in a minimal way without identity, reply and etc, this was a win for the Amaze VR team since my team found a value in the user interaction in VR spaces. As a result, we are currently working to build a social feature for interactive VR movie.